Really, I Can Ride with Kids? 1. Find a bicycling friend. When figuring out your family riding, go ahead and reach out to another bicyclist. Perhaps you two can go for a ride together before adding the kids. Maybe this bikey friend can help you plan a good route to get to the library that doesn’t take you on streets too busy with auto traffic. 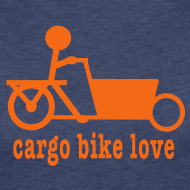 Ask to try out another’s cargo bike. Ride together to camp or school drop-off. Even if you cannot find a cyclist right down the street, go ahead and reach out to others via the web. When we first started family bike commuting, the folks we met through the Internet were invaluable. We asked their advice and looked to them for inspiration. It helps to see what others are doing and sometimes their example makes you stop and think, “Hey, maybe we could do that, too.” We have found fellow bike folks, both local and virtual, to be extremely generous and open to our many questions. 2. Find a bike shop that makes you feel comfortable. I admitted in my first post that I don’t wear padded bike shorts and have never fixed a bike flat on my own. Sometimes it can seem intimidating to be around folks with far more technical knowledge about bicycles than I have, who race bikes, or train hundreds of miles each week on their skinny, fast cycles. However, find a bike shop that makes you feel like you belong, too. Many shops see the growing interest in bike commuting and everyday utilitarian cycling so they carry items beyond those skinny, fast road bikes. Some shops are starting to cater more specifically to commuters or even specifically, cargo bikes. We are extremely fortunate to be supported in our family biking adventures by one local shop, The Devil’s Gear, here in New Haven. The folks who work there have always been enthusiastic and friendly with our family, helpful about ordering bikes/parts we need or want, and patient with our many questions and my sons’ desires to test out every bike horn in the shop, numerous times. Go ahead and plan to take a bike ride once a week to start. Think about one of those less-than-two-mile trips when you normally might take a car. Find a route on streets where you are comfortable riding. The more you are out there on your bike, the more you’ll feel comfortable doing so on your bike. Likewise, the more family bicyclists out there on the road, the safer it is for all. So take that one trip to start. Make sure your gear is in good working order and you have all those provisions you need, kids’ snacks, sippy cups, etc. including a U-Lock (really, make this a part of your investment). However, it doesn’t matter how long you ride for or how far you go, just give it a try. 5. Have fun. My family has had tons of adventures getting around town by bike. Some of those seemingly onerous parent errands suddenly became joyous when we did them together on our bikes. So allow yourself to rediscover the joy you may have experienced pedaling out there as a kid or discover this joyful experience for the first time. And if you need to reassure yourself, read Totcycle’s wonderful post “Is Family Cycling Safe?” But mostly, mostly, have fun! Well written. I like the list style. I have passed this post on to some newbie family riders. Thanks.